It seems as if the summer laze and heat may have gotten to many of us. As I was gathering the links for this monthly challenge round-up, I found that for several of them, either the challenges had been extended or haven't been posted yet. Of course, it may just be me feeling lazy about the whole thing. HA! Anyway, here are the challenges and inspirations I did find for August. The We're All Ears Challenge at Earrings Everyday usually has the earliest deadline, so I like to list if first. This month, Erin has proposed that our inspiration come from one of the top ten fabrics from Spoonflower's Circles are the New Triangles contest. You'll have to read all about it over at Earrings Everday, but I will tell you that the deadline is August 17th. That's in a week. EEK! As I mentioned last month, Facet has a Road Trip inspired challenge that is going on until August 29th. However, voting on the submissions started on August 1st so you may want to get your piece(s) in soon. At Art Elements, Marsha has created a SWIRL inspiration for the month. 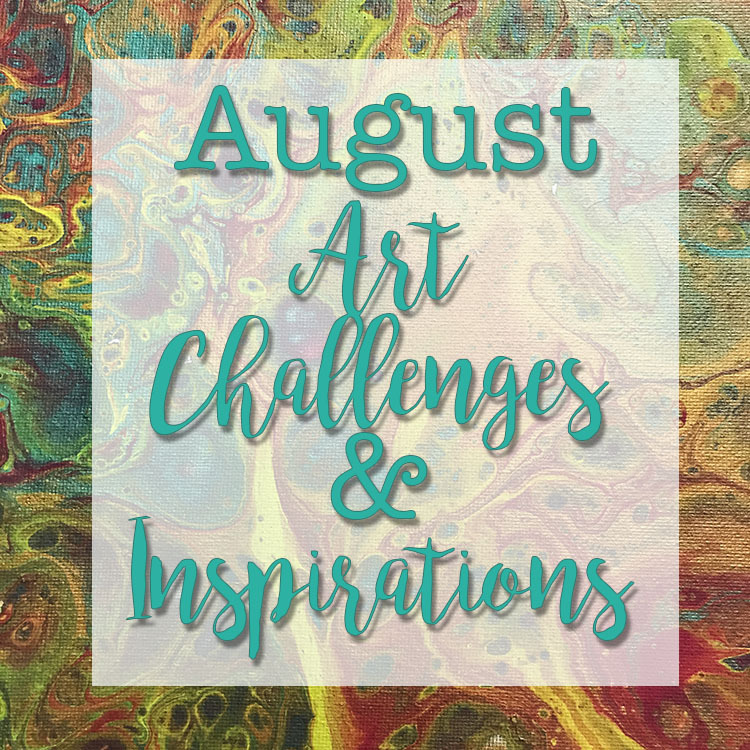 This challenge is open to any art medium, but you need to let Marsha know by Aug. 26th if you plan to participate and the reveal date will be August 30. Over at Art Bead Scene, they've extended July's Challenge to include August. Take a peek at the awesome artwork that serves as the inspiration and get to making. You've got until August 31 to submit your art (that must include an art bead.) Get all the details at Art Bead Scene. The inspiration on the Artisans Create Together Facebook Page (must be a member), is called Sea Gypsy and includes an exquisite mix of aqua and lime (two of my favorite colors!) Entries for this challenge should be in before the 31st. I'm planning on keeping my eye out to update you if anything changes, but let me know what art challenges and inspirations you find for this month or beyond that I don't have listed. I like your reminders about up coming blog hops. You just reminded me to starting a blog. I have the earrings done and photographed but nothing written. Writing is not my favorite activity but it is important to do! Ha! I'm glad you saw my post in time then! I'm looking forward to seeing what you create. I go back and forth with writing. It's an activity I tend to enjoy, but sometimes I find myself struggling to find the words I want to perfectly express myself, and that frustrates me. Good luck with your posting! Thank you, Hope, for this comprehensive list of challenges. I have returned to blogging and it is good to know what is happening right now. You are very welcome! I can't wait to see what you have to say and I hope I've helped find some inspiration for you too.